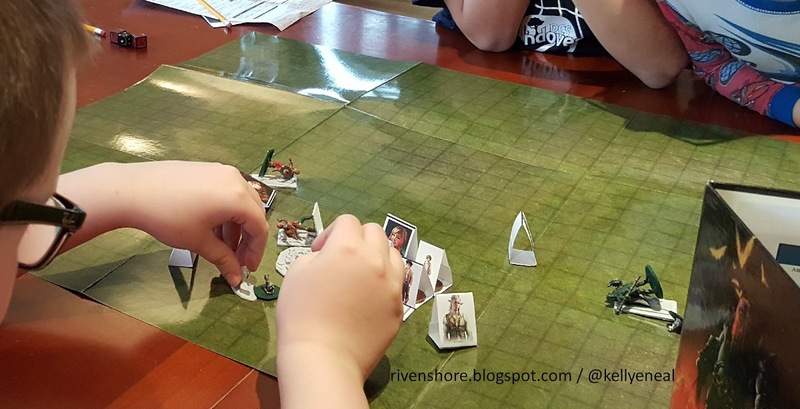 Adventures in Rivenshore: Save the kids! It's been 24 hours since our last encounter, To Fairfall We Go, and the cadets have spent that time resting and making plans for the rescue of the kids held at Fagan's. Jimmy draws out a map of the area and marks where Fagan's Tavern is. He knows that the kids are held on the second floor, and Fagan's rooms are on the third floor. He notes to Potter that it's the third floor where Fagan's treasure is. Then Jimmy heads out to get more help, planning on meeting at the Tavern. However, there still is the question of the kids. That part was true. Sarah overheard the sheriff discussing it with Guard Captain Jack Harker and knew it would be the perfect ploy to get Jimmy help breaking into Fagan's.The cadets decide to continue on the mission to get the kids out of Fairfall and head to the tavern. The three newcomers stake out the alleyway and plan to keep it free for the cadets escape out the second floor window. Deciding on the front door approach, they enter a dark tavern with a handful of patrons in it. Alexander makes his way to the bar asks for a drink. Potter then asks where the outhouse is. He heads to the back door and slowly the others join him. They detour down the back hall and make their way up the stairs, only to be greeted by who they assume is one of Fagan's thugs. He tells them to leave. Alexander tells him they just need to talk to the kids. Then offers him a bribe. That gives them 5 minutes. They meet Amelia, the oldest of the six kids that are there. She tells them that they were lured in with offers of food and a roof over their head. All together there are six children there. Amelia tells them that there are others, teenagers who've been there for a while. The cadets tell her they can get all six of them out. They get the kids out through the window, the three Rivenshore friends waiting below. They all head to the dock. They split into two boats and go across the river with only one casualtiy to sea sickness. Once on the otherside they decide to make camp and figure out what to do in the morning. 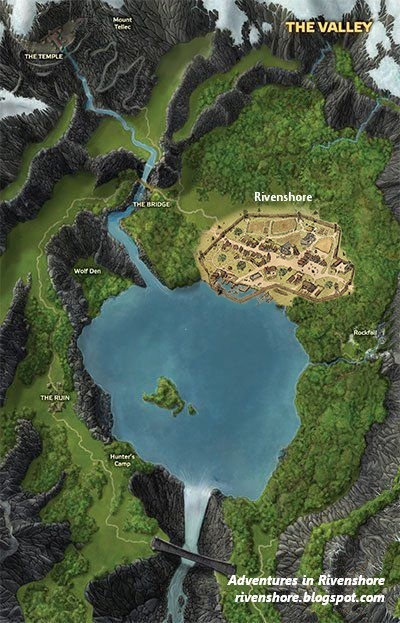 It's a long way to Rivenshore and they're on the wrong side of the river. Heading north leads them up the western pass. They all know what lies in the western past. The wolves with red eyes. After the others fall asleep, Blue takes watch, walking around the camp (for those who've been following the adventures, "James" is now "Blue". The 4 year old decided to follow his older brother's example and have a color for a name) and suddenly hears a wolf howl. He stops. Then there's another one. This wakes up some of the others. Out from behind a tree comes a wolf, the largest wolf Blue has ever seen. The others are up, but before anyone can react the wolf lets off a fierce howl that brings fear to them all. Several find themselves frozen in place, paralyzed with fear. The wolf speaks. He wants the treasure. The cadets who aren't as frightened ask what treasure, not quite putting together what he means. Some think to attack only then realizing how many red eyes are peering at them through the darkness of the forest. Potter then remembers. He quickly tells the others of Jimmy's real plan for them to steal Fagan's treasure. The wolf suddenly transforms into his human form. He's Gregor, Jimmy's father. Jimmy was supposed to find others who were expendable and then go to Fairfall and get Fagan's treasure. When asked why, Gragor tells the cadets "To feed my family." That was not the answer they were expecting. Several wolves and humans walk into view. Red eyes continue to peer out of the dark. He explains that they are called Loup du Noir, but doesn't give a lot of details at first. The cadets press on (and make amazingly good rolls, naturally) and discover that the Loup du Noir can become wolves by covering themselves with wolf hide. Unlike werewolves they are always in complete control and retain all memories of both human and wolf. The cadets remember Jimmy having several hides with him when they met. They agree to get the treasure. They're informed that the children will stay with Gregor to ensure they come back with both the treasure and Jimmy - alive and well. Upon hearing that they ask for someone from Gregor's group to come with them and help. One steps forward, named Tyler. He's young like the cadets, but has the power of the Loup de Noir. They make they're way back to the tavern. This time sneaking in. Once again leaving Tilmarion, Amariand and Glil to guard the outside for their escape. It's surprisingly easy for them to make their way to Fagan's room. The door is neither trapped nor locked. Potter peaks in - darkness. He can just make out the bed and desk from the low candlelight in the hall. They step in and even with his elven darkvision, Alexander sees only blackness other than the bed and desk. A candle lights and they all quickly turn to it. A man they assume is Fagan sitting in the corner smiles. Then a bump to the head and blackness. Waking up one by one they realize they're in two jail cells with bars separating them and solid stone walls behind and to the side. Trying to peer out side to side all they see is hallway. In the corner of one cell is dried blood. The other a dead giant rat. Their weapons, armor and equipment are gone.